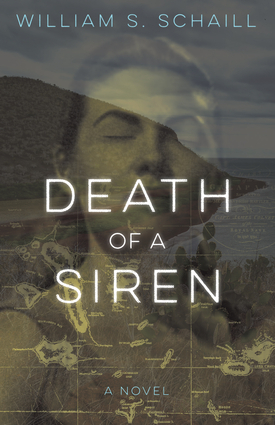 Death of a Siren is a fast-paced mystery set in the otherworldly Galápagos Islands in 1938 during the lead-up to World War II. A fugitive New York City cop is on the run from both the law and the mafia after killing a local thug. Trying to make his escape in a boat he stole from his uncle, castaway Fred Freiman, a German American, comes ashore on the islands and stumbles upon the body of a beautiful, enigmatic German baroness with a hatchet in her head. The next day the baroness's two strange companions are also found murdered. Freiman soon finds himself trapped into tracking down the murderer, or murderers, by a corrupt local official. International politics, local intrigues, and personal passions swirl around Fred as he learns more about the murdered woman, who is described by some as a monster and by others as a lost soul. Early in his investigation Freiman meets Ana de Guzmán, a young, wealthy Ecuadorian woman who teams up with him to unravel the tangled mysteries. As he struggles to solve the murders, Freiman puzzles over the baroness's shady past and begins to wonder: Do sirens sing intentionally to trap sailors, or do they sing because it is their nature to sing? William S. Schaill is the author of seven nautical thrillers, including Cabot Station, Seaglow, The Wreck of the Misericordia, and MacHugh and the Faithless Pirate. He spent a month living on the Galápagos Islands in 1961. After serving in the US Navy as a lieutenant, he had a long career in educational publishing before becoming a novelist.